Fri, Mar 29, 2019, 07:24 pm SL Time, ColomboPage News Desk, Sri Lanka. Mar 29, Colombo: Sri Lanka's Speaker of Parliament Karu Jayasuriya today said for Sri Lanka to realize its potential to become a global trading hub and benefit from globalization process, country's higher education and regulatory systems have to be revised and updated. Speaking at the Asia-Pacific Quality Network (APQN) annual conference in Colombo today, the Speaker said quality higher education is an essential ingredient to be successful in this technological era knowledge economy and pointed out the need to regularly revise the higher education systems to make the students employable. "We are all aware that to be successful in this technological era knowledge economy, quality higher education is an essential ingredient. For this purpose to remain at the cutting edge of the knowledge economy process, high education systems need be regularly revised for making students employable and industry relevant, ensuring that high quality education will enable the youth to achieve upward mobility while inculcating values of social responsibility," he said. "It is therefore timely that we work with international experts with a view to enhancing quality and standards in higher education for the benefit of our future generations." The 2019 APQN Academic Conference (AAC), hosted by the University Grants Commission of Sri Lanka, is being held from March 28-31 in Colombo under the theme "Quality Assurance in the Asia-Pacific Region: Insight into the Future." Speaking further, Jayasuriya said the education in this modern era must be designed to prepare students to become free thinkers with a capacity to innovate for enhancing quality of life of people and societies of each country, region and beyond. "Given the aspirations of the youth in our region, we have to provide the tools for them to reach their goals and aspirations. This will ensure social stability while enhancing physical quality of life in our societies." Jayasuriya emphasized that it is essential to promote fundamental as well as practical research in all fields of education to enable students and future leaders to be innovators and think leaders and quality assurance in education in line with international standards is essential to be successful in this effort. "Since time in memorial Sri Lanka has been a hub in the orient, strategically located in the East and West sea highway. Winds of change since ancient times has always touched our country. Riding waves of such changes, Sri Lanka has continued as a trading and commercial hub in the region. However, we have potential to become global trading hub like in ancient times." To enable reach this goal, to benefit from globalization process, the higher education and regulatory systems have to be revised and updated, he underscored. "In economic terms of Sri Lanka is endowed with a population that will be stabilized at 23 million people. Hence the progress of our economy and our development will totally depend on efficiency of the work force and the quality of our products and how well we are linked with the global supply chain," he said. "Therefore, we must consciously promote quality assurance, both locally and regionally to enable reach commercial and regulatory efficiency to promote Sri Lanka as a hub connecting Asia with rest of the world as Asia become the engine of world economic growth in this century." 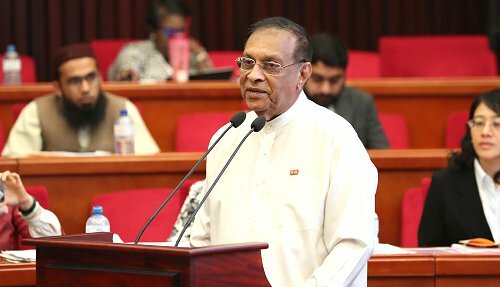 Welcoming all the delegates and the President of APQN, Speaker Jayasuriya said the deliberations of the conference will be win - win for the country, the region and beyond. "We are determined to make our country environmentally friendly paradise, and we welcome friends from all over the world to visit, invest, trade and thrive," he said.